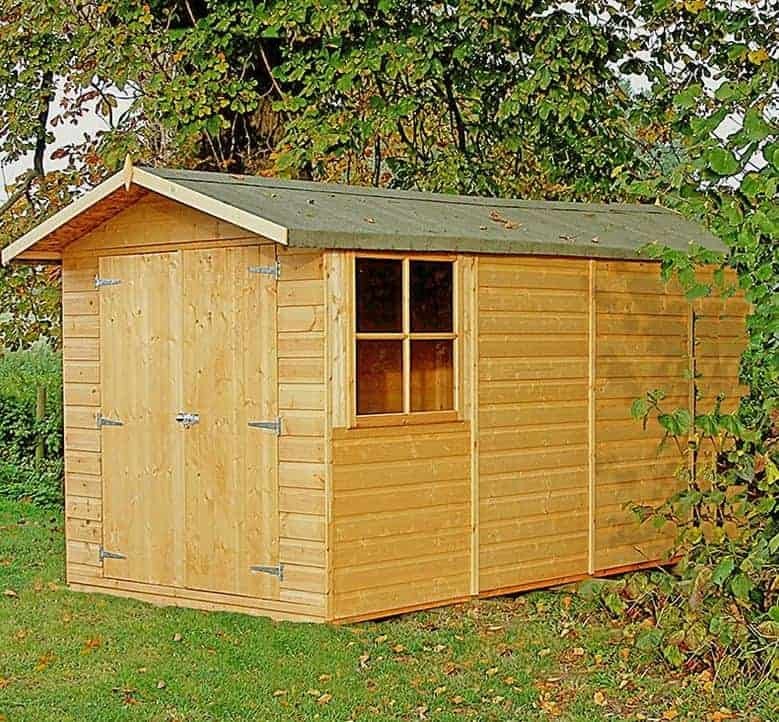 One of the most impressive looking sheds you will ever see, the 13’2 x 6’6 Shire Jersey Double Door Shed offers you an incredible amount of storage space with 13 feet of depth and over 6 feet of width. This is one very large and well designed shed that is going to really stand out and make people say wow when they see it. Thanks to the large double doors, you can put anything you would want inside of here and the shed has many different things it could be used for. Things like general storage or as a workshop would be just ideal and because of how large it is, you can really design and lay this out any way you would like. 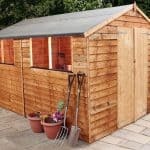 To go with the very impressive looks, Shire have used some very high quality materials in the construction of this shed. Thick tongue and groove shiplap cladding is used for the walls which stands in front of a very robust frame to ensure you have a long lasting structure. The apex roof stands out very well, but it also will stand up against any rain that falls onto it. Tongue and groove floor boards feel fantastic below your feet and can take the weight of pretty much anything you would like to store in here. Here we have one of the most awe inspiring sheds that Shire offer. This is huge and while you can get an idea from the pictures it is not until you are standing inside, you can appreciate just how much space you have at your disposal here. One thing we love about the storage space here is how it is all in the depth, this shed is 13 feet deep and while the width is still an impressive, 6 feet 9 inches the fact most of the size of this shed is in its depth means that this should fit into gardens of all different sizes. As this is such a large sized shed it is very likely that more than a few of your will be interested in using this as a workshop. 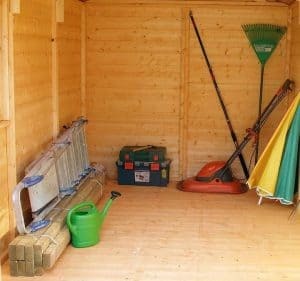 Well that is very possible because the height of the shed will make spending long periods of time in here comfortable. At the highest point along the ridge there is 6 feet 11 inches of headroom and even at the sides of the shed the height is a respectable 5 feet 9 inches. The roof on this shed is very large as you would expect. To make sure though that it is not too heavy and to avoid sagging, Shire have used some 11 mm thick solid sheet boarding. This is made with good quality softwood and is going to be able to take the weight of some heavy snow and also because of the apex design will allow the rain to just run straight off. Covering the boards is some felt which is very robust and will last for many years. 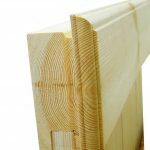 The tongue and groove shiplap cladding really does look fantastic and we really do appreciate the craftsmanship that has gone into making this look so appealing. 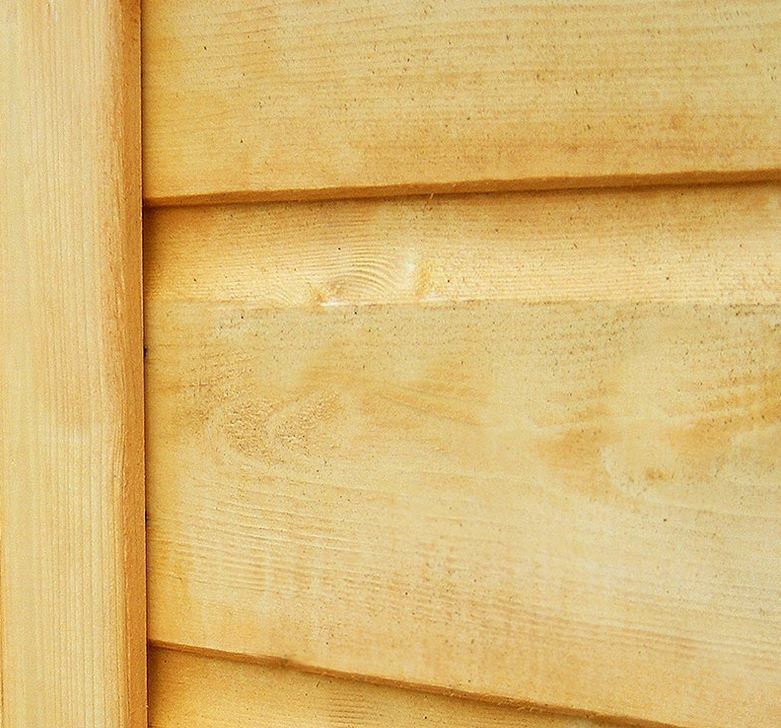 This cladding is made with planed softwood and is a solid, 12 mm thick. This we feel makes for some very strong walls which when you give them a little tap, you will see right away just how solid they are. 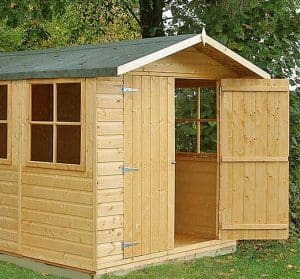 A shed of this size simply must have a good and solid frame to hold it all together and make sure it lasts for many years. Shire have gone for a very robust 34 mm x 34 mm frame that while being very sturdy does not take up much room so you will be able to store things very close to the walls without the frame getting in your way. We have no worries about the longevity of this frame at all and are pretty certain that even 20 years from now it will still be in great shape. We will admit that for the floor we really did expect Shire to use the same solid sheet boarding that they had used for the roof. Well we were very surprised to see the high quality tongue and groove flooring that they had used. This flooring looks amazing, is strong, sturdy and they somehow have added this without raising the price. The 12 mm thick tongue and groove flooring really does feel very secure when you are walking on it and that is something we love. 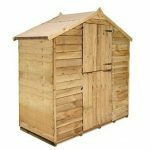 The 13’2 x 6’6 Shire Jersey Double Door Shed will be delivered to you with the wood having been treated enough to make it through the delivery and installation. Once installed you will want to give it a nice coating of wood treatment. Some people put this off and we always say this is a huge mistake. Get the wood treatment ready for when this is delivered so you can do it right away. Yearly treatment is required in order to protect the wood and make it last for many years. We feel that the one year warranty Shire give you is fair and truth be told we think it is going to be something you will not have to make use of. The large double doors are one of the first things that catches your eye. The height of the doors is 5 feet 7 inches and when both doors are open 4 feet 6 inches wide. This makes getting things as large as tables and shelving very easy. We really liked how much room you have to get in and out of the shed these doors give you. To keep the door closed it comes with a very high quality pad bolt. Each door is kept in place with three hinges. 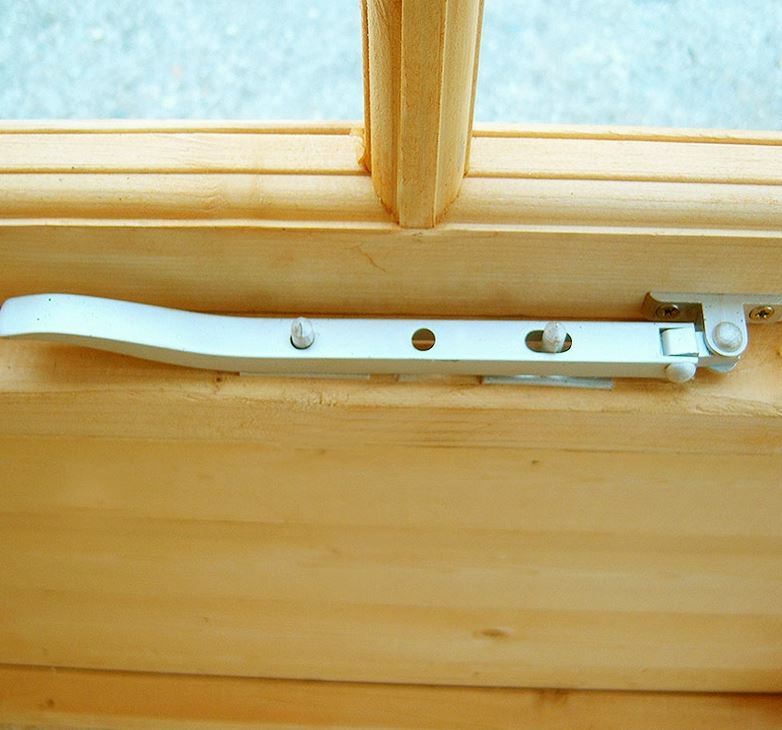 These hinges are done in a silver style which goes very well with the pad bolt. The windows on this shed are fantastic. 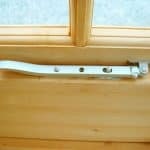 There are three and during installation, you can decide where exactly these windows will go. The windows have a very appealing look and will allow light to get inside, but the real surprise was that you can open a window to allow fresh air in. We really like it when a company puts in a window that actually opens. 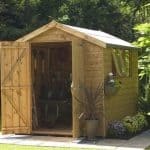 This is a shed that is made to have lots of things kept inside and if you are using it as a workshop then you will probably have some expensive things inside here. The pad bolt that it comes with will keep those doors closed tightly, but it does not actually lock the door. Thankfully this pad bolt allows a padlock to be added very easily and at a low cost. Those three large windows do not really allow for much privacy, but this is nothing a curtain, set of blinds or even some fabric could not fix. 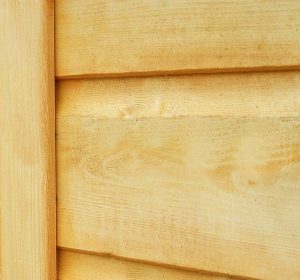 One way that you could make the shed stand out even more is to give it a coating of coloured wood treatment. A couple of hanging baskets and perhaps some cleverly placed plants around the outside would also give the shed an even better look. Thankfully this shed pretty much comes with every single thing you need. The only extra required would be some kind of locking mechanism, but with how cheaply something like a padlock can be, we feel it is not something to be concerned about. As well as looking great the whole shed is made with just very high quality materials all throughout. As long as you keep on top of your yearly coating of treatment then you will find this shed will easily last you a couple of decades. 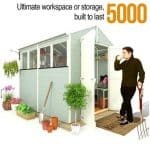 This is one of the largest sheds Shire provide and the storage space that it is offering you really is just incredible. It is so large that we are sure many people are going to buy this as a space to work and not just for storage. Any shed this large is going to take some time to build. You and a helper are probably looking at anywhere from 2-5 hours to build this depending on your DIY skill level and also depending on how many coffee breaks you take. £749 is certainly not small change, but when you consider the huge amount of space you are getting and the very good quality of the materials then this really does offer great value for money.. Final Thoughts: There is no need to build an expensive garage or extension when you can get something as large as the 13'2 x 6'6 Shire Jersey Double Door Shed. This will certainly be a very impressive structure in your garden that is going to last you lots of years. The amount of things that you could use this shed for is just staggering. 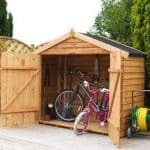 One thing that we have to mention is that while it is easy to focus on all the storage space this shed offers. This really is one fantastic looking building that really does have a great design. 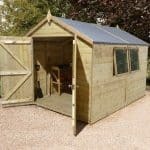 We are very impressed with what Shire have done here and if you do need a lot of storage space then this is a very fair priced, large sized shed that will offer you all the space you could ever need.